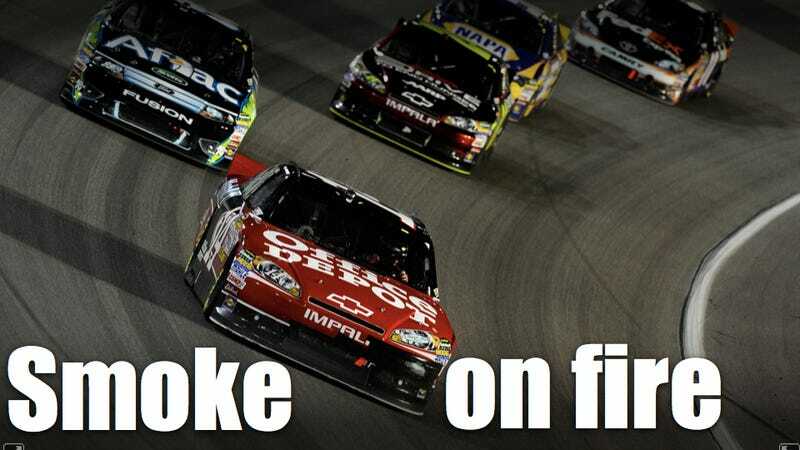 Tony Stewart edged out Carl Edwards in a season-ending Sprint Cup race that featured more yellows than a terrible pack of Mike & Ikes, more passes than Herman Cain at a secretary convention, and more hot drier action than an Atlantic City salon on New Year's Eve. For one wet night in Florida the sport we constantly make fun of for never turning right left it all on the race track in a showdown that provided more drama than the last five F1 races combined. You know it's a crazy race when the guys in the pits are intently studying Doppler radar while simultaneously doing the kind of complex fuel math that would drive John Nash insane. Or more insane. Whatever. Stewart and Edwards entered the Ford 400 separated by just three points and were tied in points at 2403 by the end of the race, but Tony Stewart was able to hold on to a one-second lead and has more 1st place finishes, thus giving him the overall victory in the tiebreaker and making him the Sprint Cup Champion. If you missed the race it's worth downloading, just fast-forward through the rain delay.